LITTLE-KNOWN WASECA PUBLISHING COMPANY FAST BECOMING A MAJOR INTERNATIONAL PLAYER IN YEARBOOK, COOKBOOK, AND SPECIALTY BOOK SALES. 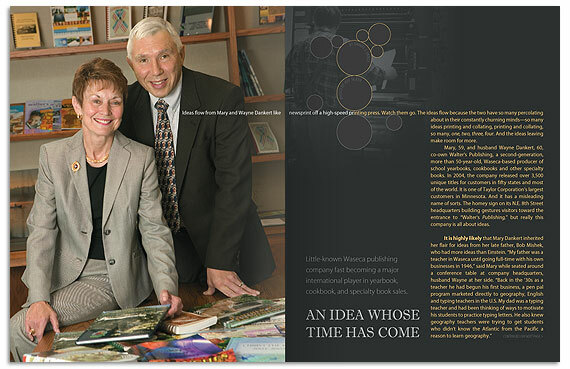 Ideas flow from Mary and Wayne Dankert like newsprint off a high-speed printing press. Watch them go. The ideas flow because the two have so many percolating about in their constantly churning minds—so many ideas printing and collating, printing and collating, so many, one, two, three, four. And the ideas leaving make room for more. Mary, 59, and husband Wayne Dankert, 60, co-own Walter’s Publishing, a second-generation, more than 50-year-old, Waseca-based producer of school yearbooks, cookbooks and other specialty books. In 2004, the company released over 3,500 unique titles for customers in fifty states and most of the world. It is one of Taylor Corporation’s largest customers in Minnesota. And it has a misleading name of sorts. The homey sign on its N.E. 8th Street headquarters building gestures visitors toward the entrance to “Walter’s Publishing,” but really this company is all about ideas. The “pen pal” business ultimately connected thousands of students from 183 foreign nations to write letters in English to American children. In the early ‘70s, Wayne and Mary purchased that business from Mishek and moved it to New York before selling it 25 years later to their New York employees. She went on to graduate in the late ‘60s from Minnesota State University in Mankato, majoring in business administration. She seemed to have a natural instinct for writing effective advertising copy to support her father’s direct mail business. Mishek eventually owned eight direct mail businesses, through which he sold private label merchandise to schools and churches, mostly paper, ink, stencils, and duplicating supplies. In time he would sell desks and chairs, but preferred disposable items with repeat sales. Besides direct mail and the pen pal business, he also would own a concrete company, credit bureaus, and three H&R Block franchises. Compared to Mary’s often rapid-fire staccatos and arpeggios, Wayne’s voice inflections were more fluid and easy-going. For instance, Mishek had helped set up a former high school student in a root beer stand in Owatonna. Years later, when buying a concrete company, Mishek hired that same student to manage it. In 1969, Mishek one day read about a “Wayne Dankert” on the front page of the local Waseca newspaper—and that this Dankert had recently graduated from Michigan State with majors in advertising and journalism. He’d been hired by the newspaper to sell advertising. It said that Dankert had taken the position in Waseca because the town was roughly halfway between Mankato, where a younger brother was attending college, and Austin, home of his recently widowed mother. Mary took up the story, saying, “When my dad read about Wayne in the newspaper, the first thing he said was, ‘I’ve got to meet this guy.’” Wayne’s educational background in advertising and journalism would mesh well with a direct mail order business, he thought. “So my father literally wandered the streets in Waseca hoping to stumble on him,” said Mary. Mishek promptly invited Wayne to tour his building in Waseca—and Mary was made responsible for showing him around. Though Wayne would soon take a job out of town with Target Corporation, the two nonetheless would fall in love and marry within a year, in 1970. After the marriage, Mishek invited Wayne to join the family business, which by then consisted of the pen pal business, the eight catalog houses, the concrete plant, three H&R Block franchises, and a trailer court. And Bob wasn’t the only one conjuring ideas and taking chances. Wayne, who Mary described as “a carbon copy of my dad,” had that first year the idea of sending cookbooks as thank-you gifts to church secretaries ordering from their direct mail catalogs. One church secretary especially liked her gift and asked Walter’s to print a cookbook for their church as a fundraiser. The company began zeroing in on cookbook publishing after Mishek—following the 1978 death of his wife—sold out to Wayne, Mary, and Mary’s two siblings. The children then began spinning off companies, such as the pen pal business, and “kept the things we wanted,” said Mary. But it was fitting that Mishek would live to the ripe old age of 90 in 1997 to see the beginnings of another family idea that would take Walter’s Publishing to the next level of success—and then some. In 1987, Wayne and Mary decided to adopt. They had never had children, yet wanted them, and through Catholic Charities in Mankato learned of two beautiful, six-year-old Korean girls. When the girls reached eighth grade in 1995, Mary volunteered as a parental advisor on their middle school’s yearbook committee. The first thing Mary did after the initial meeting “was to go back here (to Walter’s Publishing) to talk about publishing yearbooks,” she said. Within 18 months, the company was selling a full-service, elementary and middle school yearbook “program” to independent photographers around the nation. The program, which today includes expert marketing advice for schools, planning materials, and free Walter’s-designed software to help schools with layout, provides independent photographers a great way to win back yearbook business lost to national companies such as Jostens or Life Touch. Walter’s Publishing works alongside larger independent photographers taking tens of thousands of student pictures at hundreds of schools a year—as well as smaller ones taking pictures at only ten or so schools. In essence, the independent photographers of America have become Walter’s Publishing’s sales force. The results have been staggering. Early growth mainly came from elementary and middle school yearbooks, but more recent success has been through high schools and universities. About 60 percent of the company’s current sales—a company once defined by cookbooks—comes from yearbooks. Cookbooks account for only 25 percent of sales. The remainder of company sales comes from church directories, reunion, retirement and wedding books, and military tour of duty books. Such incredible growth would not have been possible without a large printer having state-of-the-art capabilities to grow alongside them, said Mary Dankert. Walter’s Publishing and its 30 year-round employees do some in-house printing with its own four-color presses, used mostly for runs of less than a few hundred, ideal for church cookbooks. But the bulk of cookbook and yearbook printing gets funneled through Corporate Graphics of North Mankato, a Taylor Corporation company, which in turn usually farms out portions of the huge volume to other Taylor Corporation divisions around the nation. In fact, Walter’s Publishing the last few years has become one of Corporate Graphics’ largest accounts in Minnesota. Walter’s Publishing and Taylor Corporation’s tight relationship began back in the mid-50s, when Bob Mishek and Carlson Craft founder William “Bill” Carlson became friends. Carlson Craft was the North Mankato-based printer Glen Taylor cut his business teeth on and would buy in 1975. The Dankerts said that Walter’s Publishing would not have grown so quickly over the last several years without Taylor Corporation’s superior ability to handle different kinds of large printing orders. Up to four Taylor Corporation divisions spread throughout the U.S. fill the orders during peak yearbook season, in which Walter’s Publishing assembles about 20,000 raw pages in pre-press daily. My brother started Arabian Horse Times magazine. Of the three children, he was the most fanatical about the Arabian horses we owned and raised. After my brother left college, he wasn’t interested in selling paper and ink. He began a magazine for the Arabian industry. He went his own direction with it a couple of years ago, and it’s no longer part of Walter’s Publishing. That happened when we bought out my brother and sister a few years ago. We now have controlling stock in Walter’s Publishing. —Mary Dankert, Walter’s Publishing. Mary’s father named his companies after family members. The name “Walter” has been in the family for generations—Mary’s grandfather was Walter Brown. Bob named another company “Charles,” which was his father’s name. Mishek was the family name—and the name of his catalog business. —Wayne Dankert, Walter’s Publishing. The daughters, now age 25, are graduates of Columbia University in New York City. One is finishing officer’s training school in the Air Force and this August will begin medical school in Bethesda, Maryland. The other is taking advanced studies in the Korean language and working in Seoul, Korea. Discovering their birth family several years ago, the twins invited the Dankerts to visit them all during Easter 2004. To help Mary raise the Twins, Wayne, in a sense, re-structured Walter’s Publishing. He made it possible for Mary to drive the kids to school in the morning, pick them up after school, and for Mary to keep working after school. It wasn’t until the twins went off to college when Mary and Wayne traveled together again on the road. Where or how can I get a copy of an old recipe book my mother bought in the 70’s? There is no date on it anywhere but it’s name is “Favorite Hometown Recipes” compiled by “Publications and Junior Classes, Miller Hight School, Hemlock, Ohio”. It was one of my mother’s favorite recipe books and before she died, she gave it to me. It is in bad shape and held together with tape. I can scan you some of the pages if that would help. I, too am hoping to get a copy of an old cookbook that was my mother’s, and my sister and I fight over who gets possession. This has been going on for years. I thought it would be great if I could purchase a copy and give it to her for Christmas. That would be awesome! I am missing the cover, but one of the hilarious recipes under main dish section is a recipe for “elephant stew”. Perhaps that will tell you which book I am referring to. Can you please pass on my email to Mary Mishek Dankert? She was one of my students at Minnessota State University in Mankato. Thanks! Hello Prof. Tenorio, I’m afraid Walter’s was purchased by Taylor Corp. several years ago, and I don’t even know if Mary Mishek Dankert is still with the company. You might have some luck trying LinkedIn.